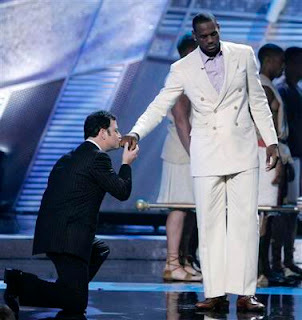 I am torn about my feelings for LeBron James right now. Let me be perfectly clear, I hope he stays in Cleveland. But with the LeBron James Free Agency Circus, I am starting to wonder is it worth it for the cost. Is Cleveland selling its soul for a shot at a championship? As ESPN and the other sports reporters will tell you, it has been awhile since Cleveland had a championship. The city is desperate for a champion. Right now, and for the future, the Cavaliers are it. The Browns are once again rebuilding and the Indians...I don't know what they are doing right now. The Cavs keep coming *this* close. Cleveland is waiting to be witness to a winner. The city of Cleveland loves LeBron James. I can't think of another city that has gone to the lengths that Cleveland has for one of its athletes. What other city has a Nike ad as a tourist photo stop? Hundreds of fans have lined street corners with signs encouraging LeBron to stay. Every city official it seems has been in a "We Are the World" type video begging the King to stay. The Cavs spent 6 months working on a cartoon to present to him. Fans have joined together to pay for billboards and have held rallies. I can't help but wonder if he cares. Does he even notice it anymore? For years, LeBron has been King of Cleveland/Akron/Ohio. A 10 story billboard of yourself outside of your office has to take getting used to. Maybe that is what he expects now. Maybe he expects everyone to jump through fiery hoops on one leg. Originally, I thought it was a point in Cleveland's favor with all of the team meetings happening in his office. But then I heard that LeBron was showing up to meetings in shorts and a t-shirt, 40 minutes late. That behavior is a mixture of arrogance and entitlement. Maybe someone should have showed him a clip of game 5. The game that he gave up. He will never be as big and as large in any other city as he is in Cleveland. In NY/NJ he is just another big fish in a sea of big fish. Miami? Maybe. Chicago? No way. Chicago is the home of Michael Jordan. If LeBron goes to Chicago, he will forever be in the shadow of Michael. There will never be a LBJ statue in Chicago. No matter how great he becomes, I am sure Jordan will not want to share the stage. All this makes me think of Peyton Manning. I lived in Tennessee when Peyton was a Volunteer. The entire state revolved around UT football. If UT were playing, you could walk naked down the street and no one would see you. If UT played 'Bama, you could walk down the street with a parade of baby elephants in tutus and no one would see. Peyton was a big deal. When he decided to stay at UT for one more year, it was on the cover of every paper, front page - above the fold. Peyton was a hero and already a legend in Tennessee. Peyton later followed me to Indiana. And what he did when he arrived, stuck with me as a testament to his character. 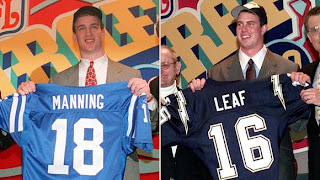 The Colts were looking for a quarterback at the NFL Combine, and it was between Peyton Manning and Ryan Leaf. When Peyton arrived to talk with the team, he showed up in a suit and tie. He also came prepared with a notebook full of questions. When the Colts asked Peyton what he would do if he were selected as the first round pick, he said he would request a playbook to start studying the Colts offense. Ryan Leaf on the other hand said he wanted to take his buddies to Vegas for one last hurrah. What's my point? It seems like LeBron is playing with the city of Cleveland because he can. He wants to be a billionaire business man. He needs to start acting like it.